We are saddened to report the death of Morton J. Gross (z”l), former Federation Board member, father of Board Chair Gary Gross, past Board Chair and Life Trustee Harley Gross, and grandfather of current Board member Sarah Zimmerman. Mort was a devoted husband to Toby and the loving father of a large, Jewishly committed and philanthropic family. A true patriarch in every sense of the word, he was passionate about Jewish education and continuity. This passion is both symbolized by his commitment to the school that bears the family's name - Gross Schechter Day School - and through his work as past president and long-time community leader at Congregation B'nai Jeshurun, where he was instrumental in building the congregation's new synagogue in Pepper Pike. Mort was also a dedicated former board member of Jewish National Fund and Cleveland Hebrew Schools, as well as a former member of the Federation's Endowment Fund Committee and Real Estate Committee. Our thoughts are with the entire Gross family during this difficult time. May Mort's memory forever be a blessing. 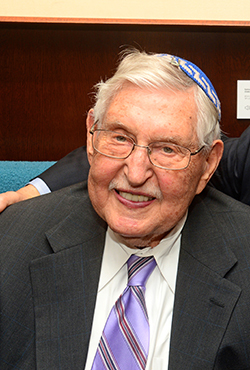 Morton Gross, who died Jan. 19 at age 94, was remembered for his commitment to his family, Jewish education and Israel. Gross, who lived in Shaker Heights, was the owner of Gross Builders in North Royalton, a construction and property management company. He was a leading donor to Gross Schechter Day School, prompting the school to be partially named in his honor. According to his sons, the creation of the school was a badge of pride for him. Gross also said that interest led Morton Gross to be involved in Gross Schechter Day School’s annual Kosher Rib Burn Off, held over Labor Day weekend, well into his 90s. He was also an early supporter of Cleveland Hebrew Schools, according to his sons Harley and Jeffrey Gross. In addition to his generosity in Cleveland, Gross also endowed a training institute for Hebrew school teachers at the Jewish Theological Seminary in New York City. Gross showed his commitment to Israel early, making a trip to the country for the first time along with his wife, Toby, in 1960 and returning many times with family or on Jewish Federation of Cleveland mission trips. Gross also made purchases of Israel bonds and was a leader of the Cleveland chapter of the Jewish National Fund. Gross was a founder of B’nai Jeshurun Congregation’s young people’s congregation and later president of the synagogue, helping with fundraising and construction of the building on Fairmount Boulevard. 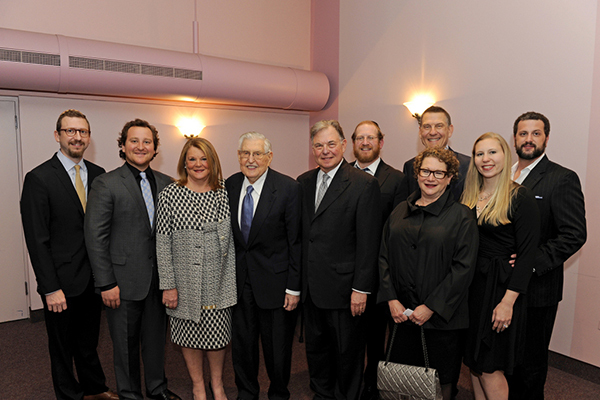 “Mort was a pillar of our synagogue, whose leadership and vision shaped the best of everything B’nai Jeshurun is today,” said Rabbi Stephen Weiss, senior rabbi at B’nai Jeshurun. “He led the charge to move to Pepper Pike, overcoming significant opposition because he saw how critical it would be to our future. He helped lead the cutting-edge design of our campus that broke with traditional models and created a flexible, engaging space that encouraged engagement and community, as well as a sanctuary with a low, accessible bimah that thrust slightly into the congregation. Weiss described Gross as “extraordinarily devoted to his family” and said his family embodies the values he passed on to them. Harley Gross said his father’s greatest legacy lay in the family that survives him. Gross is survived by his wife, Toby; sons, Harley (Rochelle), Jeffrey (Laurel), Gary (Cari) and David (Marjory) Gross; grandchildren, Gene, Abraham (Aviva) and Aaron Gross, Margaret (Josh) Michaelson, Zack (Sheera) Gross, Sarah (Scott) Zimmerman, Emily (Andrew) Fuchs, Rachel Gross, Gleena (Dan) Fix and Carolyn Gross and 24 great-grandchildren. Services were held Jan. 21 at B’nai Jeshurun, with about 500 people attending. Interment was at Chesterland Memorial Park in Chester Township.